Not at all what I had expected. Having read the book recently, I had really big expectations for this cult movie, but I felt let down. I know it is almost impossible to make a book into a movie, unless you make it a three-part movie of three hours each, but I really feel like it could have been done better. I think a lot of important stuff was cut out, to squeeze this book down to a "mere" 137 minutes. If you have not read the book beforehand, this movie is going to seem like a terrible superficial mess. Apparently a miniseries has been done on the book, but I have not seen or heard anything of it. I this age of rebooting movies, I wish this could be one of them. The book is really a classic, and it has a lot of potential to be made into something fantastic. As this movie is made in the mid eighties, the effects are quite analogue, but I think they have still aimed high for a movie of its time. Maybe a bit too high actually. As the book is written in '65, it is limited how detailed it is about technology, and in a way you get a feel of a cross between the middle ages and a western. This is translated in to a post modern western in this movie. The mechanical effects are quite good (floating objects, fancy vehicles and enormous sand worms), but some of the visual effects are just lame. The acting ranges from average to below average. Not that impressive. 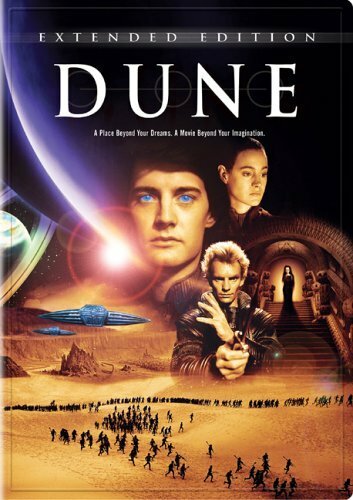 As this is a cult classic you should watch this movie if you have any interest in sci-fi. It is nothing fantastic, but as long as you do not have as high expectations as me, I guess you will be al right. I would recommend that you read the book instead though.